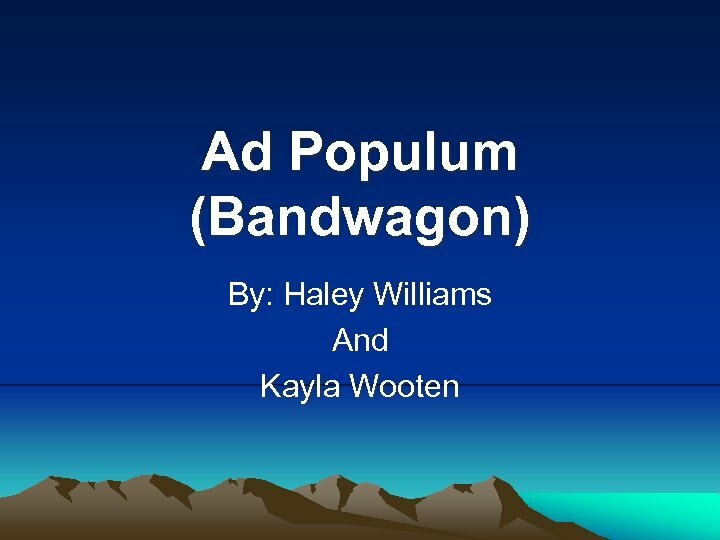 Bandwagon • The arguer takes advantage of the desire most people have to be liked and to fit in with others and uses that desire to try to get the audience to accept his or her argument. 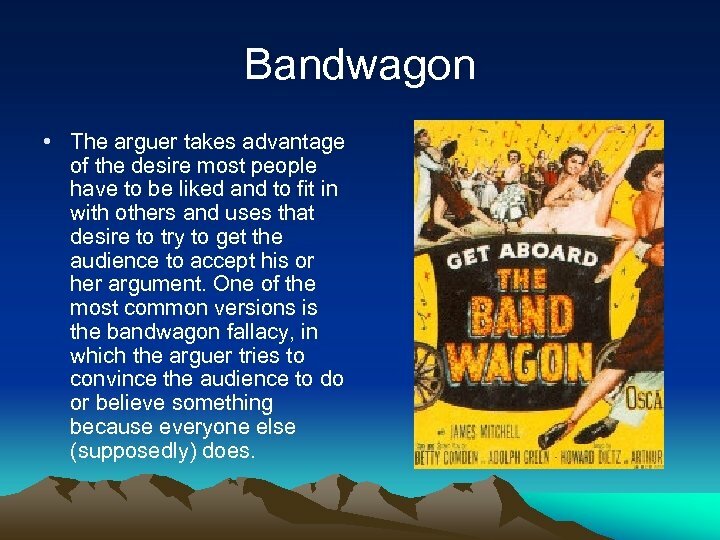 One of the most common versions is the bandwagon fallacy, in which the arguer tries to convince the audience to do or believe something because everyone else (supposedly) does. Pop Culture Examples Bandwagon is being with whose popular and in this ad dad stays with the popular team. The concert shows people, famous and not, all drinking Pepsi, so you should to. 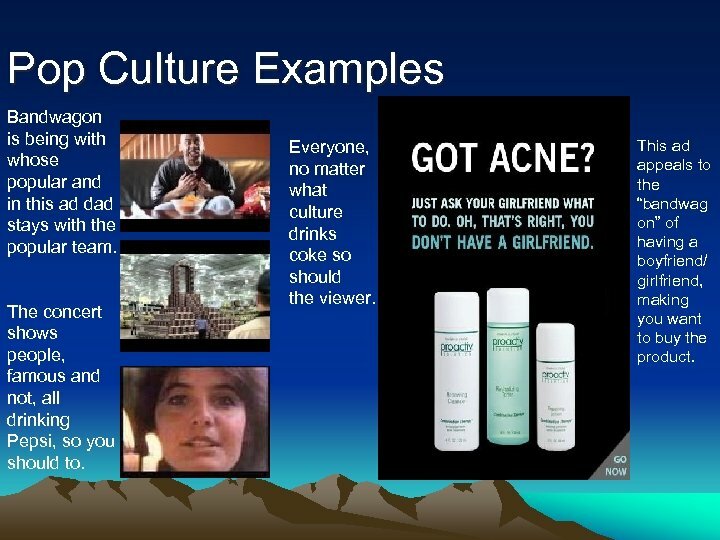 Everyone, no matter what culture drinks coke so should the viewer. This ad appeals to the “bandwag on” of having a boyfriend/ girlfriend, making you want to buy the product. 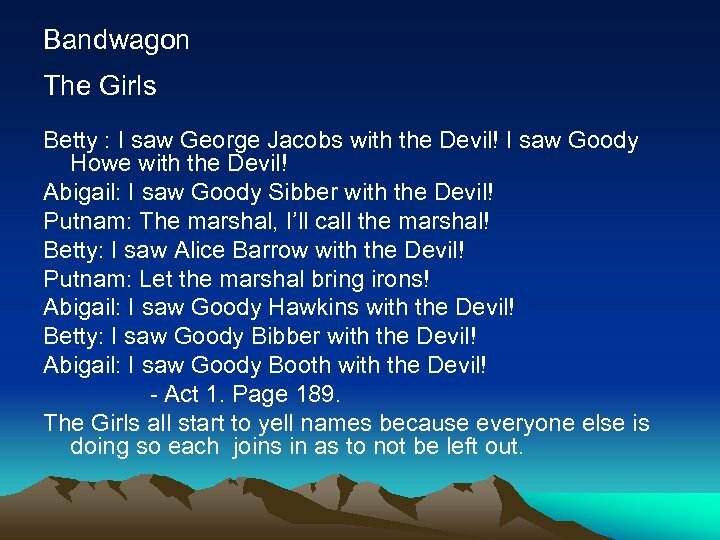 Bandwagon The Girls Betty : I saw George Jacobs with the Devil! I saw Goody Howe with the Devil! Abigail: I saw Goody Sibber with the Devil! Putnam: The marshal, I’ll call the marshal! Betty: I saw Alice Barrow with the Devil! Putnam: Let the marshal bring irons! Abigail: I saw Goody Hawkins with the Devil! Betty: I saw Goody Bibber with the Devil! Abigail: I saw Goody Booth with the Devil! - Act 1. Page 189. The Girls all start to yell names because everyone else is doing so each joins in as to not be left out. Bandwagon Mary Warren and the Girls Mary Warren: Abby, stop it! Girls: Abby, stop it! Mary Warren: Stop it! Girls: Stop it! - Act 3. Page 225. 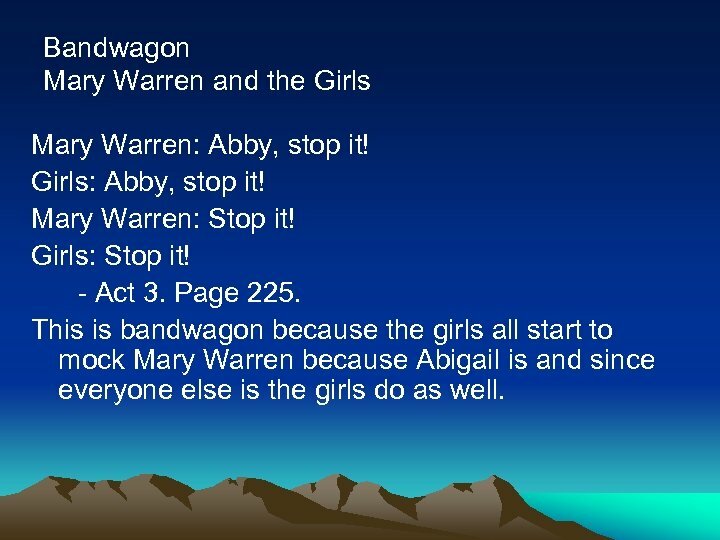 This is bandwagon because the girls all start to mock Mary Warren because Abigail is and since everyone else is the girls do as well. Bandwagon Mary Warren: No, I love god; I go your way no more. I love God, I bless God. (sobbing she rushes to Abigail) Abby, I’ll never hurt you more! - Act 3. Page 226. Mary turns against Proctor because she “jumps on the bandwagon” of the other girls. 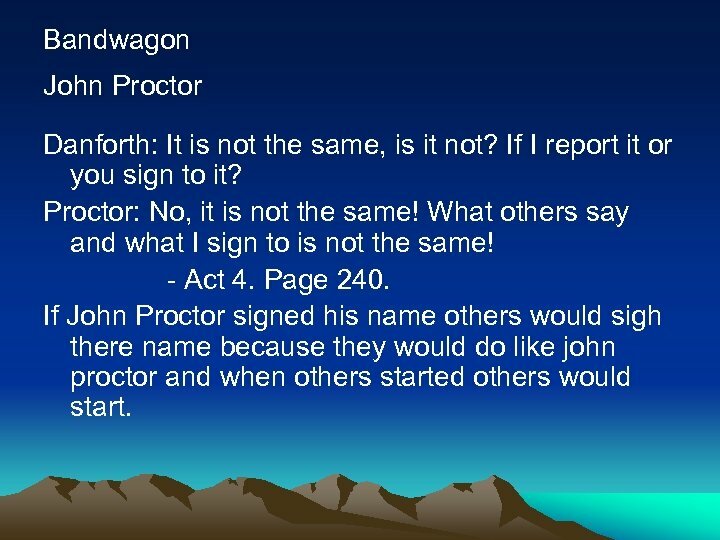 Bandwagon John Proctor Danforth: It is not the same, is it not? If I report it or you sign to it? Proctor: No, it is not the same! What others say and what I sign to is not the same! - Act 4. Page 240. If John Proctor signed his name others would sigh there name because they would do like john proctor and when others started others would start. 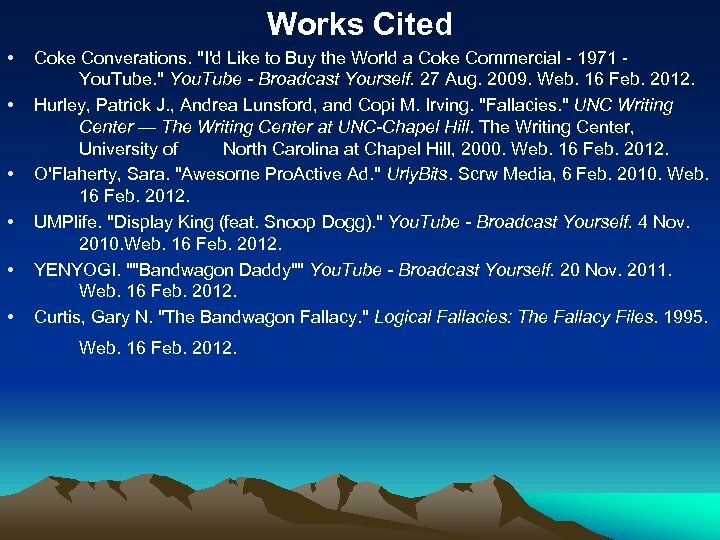 Works Cited • • • Coke Converations. "I'd Like to Buy the World a Coke Commercial - 1971 You. Tube. " You. Tube - Broadcast Yourself. 27 Aug. 2009. Web. 16 Feb. 2012. Hurley, Patrick J. , Andrea Lunsford, and Copi M. Irving. "Fallacies. " UNC Writing Center — The Writing Center at UNC-Chapel Hill. The Writing Center, University of North Carolina at Chapel Hill, 2000. Web. 16 Feb. 2012. O'Flaherty, Sara. "Awesome Pro. Active Ad. " Urly. Bits. Scrw Media, 6 Feb. 2010. Web. 16 Feb. 2012. UMPlife. "Display King (feat. Snoop Dogg). " You. Tube - Broadcast Yourself. 4 Nov. 2010. Web. 16 Feb. 2012. YENYOGI. ""Bandwagon Daddy"" You. Tube - Broadcast Yourself. 20 Nov. 2011. Web. 16 Feb. 2012. Curtis, Gary N. "The Bandwagon Fallacy. " Logical Fallacies: The Fallacy Files. 1995. Web. 16 Feb. 2012.